EXCITED schoolchildren looked on as machinery swung into action at Lackagh National School this week, where the construction of a new school building has begun. The 2.5m project will deliver a new eight classroom school, with multi-purpose gym, library and ancillary rooms, which is expected to be completed within 12 months. At a ceremony on the site last Thursday, Fr. Des Walsh performed the honours of turning the sod, accompanied by the oldest and youngest pupils in the school, Chloe Devaney and Rachel Jackson. 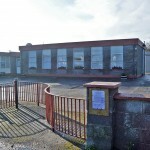 Principal Michael Lydon said the project had been ten years in the pipeline, and there was great relief and excitement that work on the new building was underway. “The site was donated by the Archdiocese and we have had tremendous support from our local representatives in getting this over the line,” he said. 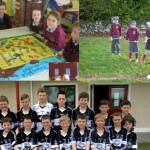 “We also have a fantastic Board of Management, Parents’ Association and staff who have all worked together to help in bringing this to fruition. 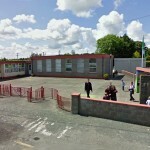 Our school enrolment has doubled over the past decade, such is the growth of Lackagh and the surrounding areas. Fr. 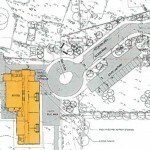 Walsh led the children in prayer before he performed the sod turning and joked that the work being done was the first time the site had seen a shovel, as his gardening endeavours hadn’t extended that far. “While the builder has already started preparations for our new school, this is a very, very special day for our school and it is important that we mark the beginning of the project,” he said. The school also celebrated the launch of a book last Friday evening at Turloughmore Community Centre. 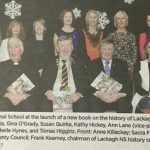 The History of Lackagh NS 1860-2016 was edited by local Fine Gael councillor Frank Kearney, and was accompanied by a CD of music and song, Laéthanta Scoilc, performed by the pupils.